Don’t have the Staff, Contact ASI! While we specialize in waste and recycling services, here at ASI, that isn’t all we do! 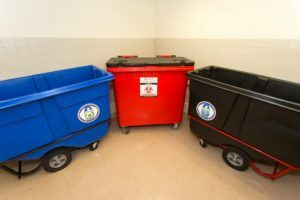 We provide on-site services for our customers for everything from collecting waste and exchanging sharps containers, to full dock management programs including janitorial and maintenance projects. Our sharps container exchange services is a full service program. Initially, we install the brackets for the reusable sharps containers throughout the facility. We are usually able to utilize the same holes from the brackets that are being replaced, minimizing the patching and painting. We will patch and paint the walls at the container locations requiring it. Our staff then comes in on a pre-determined schedule and exchanges the full sharps containers with empty containers. The full containers are delivered to the treatment facility for processing. The same technician is capable of packaging and loading regulated medical waste for transport. We track and report the containers so that we can provide our customers with a plastic diversion report for the sharps containers that are eliminated from the regulated medical waste stream. Our dock management programs include a solid waste, recycling, regulated medical waste, reusable sharps container exchange, universal, and pharmaceutical waste management. 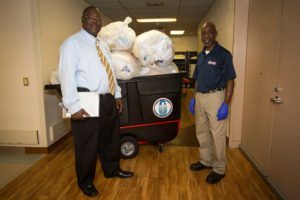 These programs include an on-site supervisor and the staff required to manage all the waste at your facility. We will even go to the various areas and floors to collect waste and recyclables from central collection points. We provide the packaging, manifesting, tracking, reporting, and training for the regulated waste streams we manage. Our staff is uniformed and readily identifiable. They are professional and courteous. We take the time to train our employees on their duties to make certain they are exceeding our customers’ expectations! We provide all compaction and baling equipment as part of our dock management programs. We provide the installation of the equipment, preventative maintenance and repair, and even back up services when equipment is down. We will typically install a baler to help the facility maximize the return for their cardboard. We provide new or like new equipment, to minimize any downtime, but we always have a solution in place for any potential downtime due to equipment. We also provide striping, cleaning and power washing of loading dock areas with our dock management programs. We will work with your facility to set the dock up in the safest and most efficient way possible, and then we will maintain the area as it is set. We are available to provide on site services for a wide range of needs. 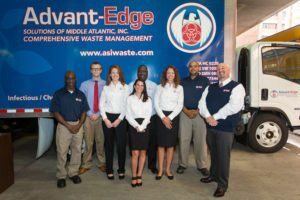 We are very flexible and would be happy to review any needs for maintenance, janitorial, or waste and recycling services. Contact us today to see what on-site services we can provide for your company!